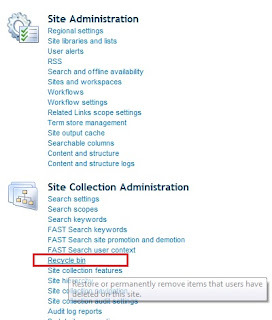 SharePoint Recycle Bin stores and keeps a track of the items deleted from the site. When an item is deleted in SharePoint, it is not completely deleted, it is actually stored in a Recycle Bin . The main idea of a Recycle Bin is to restore contents that are accidentally deleted or retrieve data that should not have been deleted. There are 2 stages to the Recycle Bin. Whenever an item is deleted from the site it goes to the Recycle Bin (users’ Recycle Bin) of the site and stays there till it is restored or it expires. By default the items are stored in the Recycle bin for 30 days. 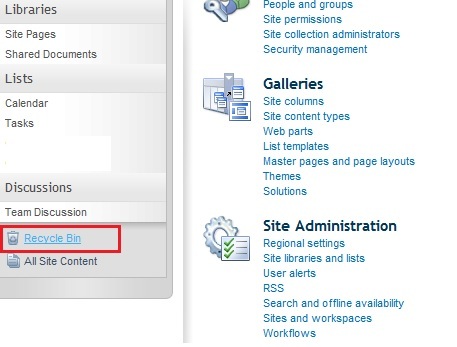 This setting is configured at the web application level from Central Administration. You can access a site's Recycle Bin by clicking on the Recycle Bin link on the left navigation (Quick Launch). If an item is deleted from the User’s Recycle Bin (First Stage Recycle Bin), it goes to the Site Collection Recycle Bin (Second Stage Recycle Bin). When an item is deleted from a site's Recycle Bin it goes to Site Collection Recycle Bin and stays there till it is restored or it expires. By default the items are stored in the Recycle bin for 30 days. If the item is deleted from here, it is deleted forever. 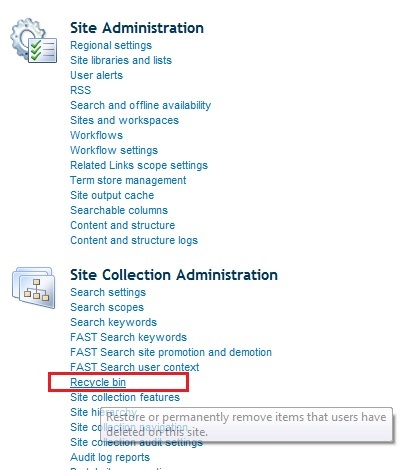 To access the Site Collection Recycle Bin, browse to Site Settings -> Site Collection Administration -> Recycle Bin. - If an end user deletes and item, it will go to his Recycle Bin. Other users will not be able to see another users’ recycle bin. - When you disable the Recycle Bin feature, all the items existing in it will be removed permanently.